Samuel L. Jackson has finally been asked the question that Marvel Cinematic Universe fans have been waiting nearly a year for. At the end of Avengers: Infinity War, Jackson's Nick Fury pulls out an upgraded pager and sends out a message to Captain Marvel before turning to dust after Thanos achieved his Decimation goal. Since then, we have learned that Carol Danvers is the most powerful character in the MCU. So why did Fury wait so long to call on Danvers if he's had this pager for so long? There are slight SPOILERS for Captain Marvel below, so read ahead at your own risk. 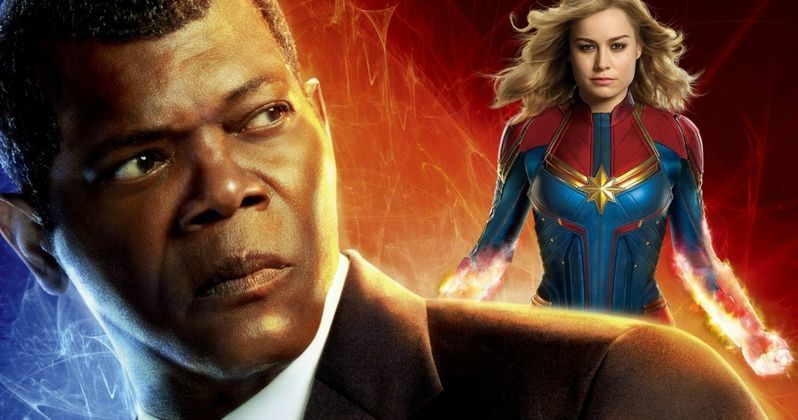 In a new interview, Samuel L. Jackson reveals why he waited so long to call on Captain Marvel for help. In the Carol Danvers standalone movie, we see the relationship between Fury and Danvers grow along with the origin of the now infamous pager. She warns him to only use it in case of emergency and Fury takes that to heart. Jackson had this to say. "She said only in emergencies. Other emergencies could be handled by the people who were present. It's just an alien invasion, that's something that could be handled. Half the population wasn't dying and flicking off and doing whatever. We finally have an emergency that I feel warrants her presence. This is unprecedented. How are you gonna fight that? I can't fight that. If I'm not here, I need to find someone to come here who can handle it. All those people are ineffective. They're great for normal, everyday world disaster. But intergalactic badass who has all the Infinity Stones needs a bit more." This proves that Nick Fury has had nothing but confidence in his Avengers over the years. And for the most part, they have been able to handle everything that has been thrown at them. Infinity War proved to be an entirely different ballgame for Earth's Mightiest Heroes, who are left to pick up the pieces for Avengers: Endgame. Even Fury was a victim of the Decimation, which adds an entirely new dimension to their crisis. The Captain Marvel prelude comic, Prelude #1, also gave an explanation as to why Nick Fury waited until Infinity War to contact Carol Danvers. In the comic, Fury shows Maria Hill the pager and tells her of its importance while stating that Danvers is only to be used as a last resort. The comic's writer Will Corona Pilgrim echoed this statement and called Danvers the "Silver Bullet" that he is only to call on when all else fails. Now that Nick Fury has reached out to Captain Marvel, is it too late? The damage at the end of Infinity War has already been done and our heroes are going to have to figure out a way to reverse the Decimation. Avengers: Endgame will prove if Fury's distress signal was worth it in the end, but we'll just have to wait and see how that panned out for everybody. You can check out the interview with Samuel L. Jackson below, thanks to the IGN YouTube channel.